Spring is here! Goodbye, yucky winter weather and short days. Say hello to budding leaves, blooming flowers and rain, lots and lots of rain. While spring brings the excitement of warming weather, it also brings hazards like heavy April rain showers, basement flooding and damaged pipes. 1. Moving water can erode soil where a pipe is buried; exposing it. Heavy rain can create rushing water that becomes a powerful force. This force can erode the soil around buried pipes, exposing them to damage. This is particularly concerning for the plumbing lines coming to your house from the city’s system. Make sure you know where your pipes are buried and take extra care during and after flooding to avoid those areas. Once the rainwater has subsided, do a thorough check to make sure they are still buried. If the soil has been eroded, inspect the pipes for damage or have one of our plumbing experts come out and inspect them for you. Flooding brings debris as well as lots of water. This debris can easily gather in a storm/drain pipes causing them to back up. If the pressure is high enough from the water draining, this can lead to bursting. You can minimize the risk of bursting by keeping your yard clean so there is less debris to back up your drainage system. 3. Pipes can corrode faster. Depending on the material of your piping, exposure to flood waters and any changes in water chemistry can cause it to rust faster. This most often happens over a number of seasons of flooding and heavy rains. Inspect any visible piping for signs of rust, particularly if you have old cast iron piping in your home. Copper also corrodes and gets pinhole leaks so you still have to inspect those pipes as well. 4. Dirt and debris in the water supply can erode pipes internally. internal wall of drainpipes. While you cannot inspect the inside of pipes, you can call in one of our plumbing experts if you are concerned that you might be at risk for damaged piping from dirt and sediment erosion. Let us inspect your home’s plumbing to make sure it can withstand this April’s showers. When the floodwaters subside, we can help you find and repair any damage you may have incurred. Give us a call and we will keep your piping in shape for many more years of spring weather! Winter weather is slowly creeping up on us and your pipes are extremely vulnerable to the cold, especially at night. Whenever temperatures start dipping below 32 degrees, the water in your pipes is at risk of freezing. 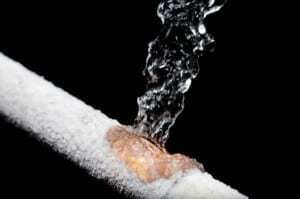 Frozen pipes are any homeowner’s worst nightmare during the winter months. When water freezes, it expands. And if the water inside your pipes expands, the results can be disastrous, not to mention expensive! 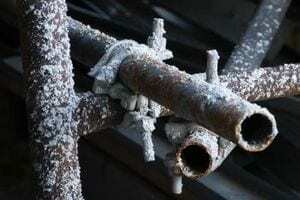 If you want to avoid a fractured frozen pipe this winter, be sure to take these precautions. crawl spaces and unfinished basements. If your bathroom and/or kitchen sink’s plumbing runs along an exterior wall, try leaving cabinet doors open, to allow heat to reach under the sink. Never set your thermostat lower than 55 degrees. Have any older pipes and plumbing fixtures replaced by a plumber. (You may want to replace any plumbing that is prone to clogging, as well). Be sure to seal any gaps in your insulation, especially if these gaps are near any plumbing. If you can, have any pipes exposed to cold air, re-routed. Have your heating equipment inspected by a professional, to prevent equipment failure. For colder winter nights, set your thermostat a little warmer to help protect your pipes. If you are going on vacation or planning to be away from your home for an extended period of time, you may want to shut off the main water valve to your home. Then drain all of your plumbing pipes and turn off your hot water tank. In the event of a power-outage, you can help reduce your chances of frozen pipes by letting water slowly drip out of your faucets. If water is not coming out of your faucets, you will want to close the main water valve to your home and drain the existing water that is already in your pipes. If you can, insp ect the pipes to see if they are just frozen or if the pipe has burst. The flooding will not start until the water thaws buying you some time. 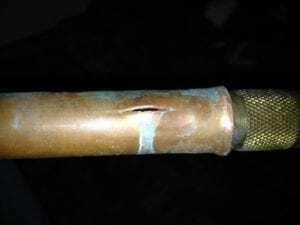 If your pipe has burst or you are unable to tell call us at (866) 844-3770 immediately. If flooding happens, shut off your main water valve. Avoid using your toilet, unless you are 100% positive that the water supply to the toilet is functioning properly. Winters can be rough for those of us in the Metro East Area, but remember if your pipes do freeze, we are here 24/7 to help you. Just call us at (866) 844-3770 or feel free to check us out online at TrustTiger.com. Prepare Your Plumbing For The Cold Weather! Summer has taken its last breath, but we all know that the cold days of winter will be upon us soon. When the cold weather blasts the majority of Illinois, homeowners brace themselves for both plummeting temperatures and soaring heating costs. Beyond the higher energy costs, cold weather can also bring additional expenses in the form of frozen pipes and clogged drains, causing problems with plumbing. Here are some simple tips for insulating your pocket book against cold weather costs. Prevent exterior pipes from breaking by protecting your outside faucets. Detach all exterior garden hoses and insulate the faucet against frigid weather. Also insulate any exterior pipes that are exposed. Tiger Plumbing offers a variety of winterizing options for your outside faucets and pipes. 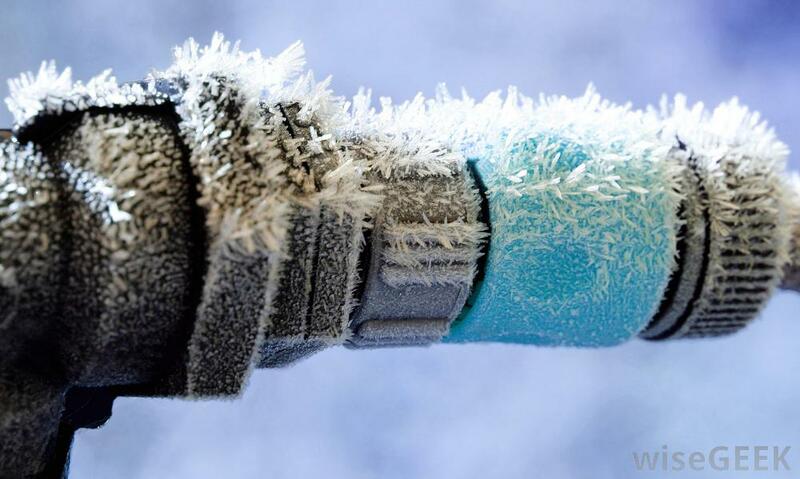 During extreme cold, even interior and covered pipes can freeze. 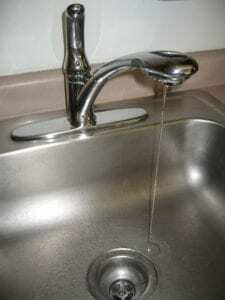 As a prevention, turn on an inside faucet and allow it to drip during the coldest winter snaps. The running water will keep the water flowing and prevent the pipes from freezing in all but the most extreme cases. It’s easy to forget about protecting pipes in utility spaces such as the attic or basement; however, these are also prone to freeze in severe weather. Protect these spaces from drafts as much as possible and remember to get the pipes insulated in these areas as well. Tiger Plumbing offers a variety of winterizing options for your utility spaces and crawlspaces. One staple of the holidays is all of the home cooking and fatty foods. The drains and pipes of your home can take a beating during this time and the cold weather solidifies the fats, resulting in a higher incidence of clogged drains. Steer clear of drain problems by avoiding putting grease, oil, and hard to dissolve foods (such as potato peels) down the drain or through the garbage disposal. By following these few simple plumbing tips, you can bypass the most severe plumbing repair problems. If you find yourself with a frozen pipe or clogged drain, give Tiger Plumbing Services a call today at 1-866-TIGER70 or visit TrustTiger.com to schedule an appointment. One of our qualified service technicians will get everything working properly!